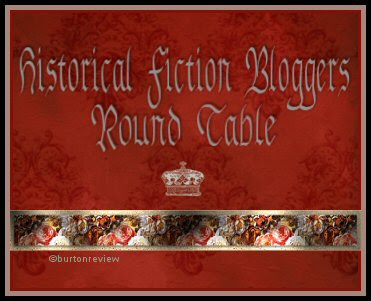 Don't forget to visit the other blogs for more blogger Round Table interviews, yesterday's was Amy interviewed and guest post at Hist-Fic Chick and today's Royal Heiress is Lizzy from Historically Obsessed where she is being interviewed by Arleigh at the Historical Fiction site along with a guest post on Catherine Howard, the young naive wife of Henry VIII! Kate a.k.a Kathy, has taken time out of her busy copy-editing schedule of that book & writing a new one A Royal Decree for the series (which includes the time from Henry VIII's reign to his daughter Mary's reign) to offer us a glimpse of one of the other sides of her work. Aside from also writing Historical mysteries called the Face Down series as Kathy Lynn Emerson (read on for this giveaway), writing under another pseudonym Kaitlyn Dunnett, penning several non-fiction books, Kathy has also created a website devoted to Tudor women. MY LITTLE SIXTEENTH-CENTURY HOBBY . . . OR IS IT AN OBSESSION? I have a little hobby. Well, okay—my husband calls it an obsession and he may be right. Whatever it is, it is a labor of love and it is very rewarding. Not only does it provide the occasional thrill of solving a mystery but it also supplies me with more ideas than I’ll ever be able to use in my novels about sixteenth-century women. Forgive me while I fill in a little history. Way back in the “dark ages” (1976-1980), when I made my first attempt at writing historical novels, I wasn’t very good at it. (I’m a much better writer now. Honest!) To make a long story short, I wrote five great long tomes set in the sixteenth and seventeenth centuries and none of them sold. As I was doing research for those novels and busily collecting rejection letters, I realized that I had accumulated a tremendous amount of information on the real women of the sixteenth century. At that time there was still no such a thing as women’s studies. Women, if they were mentioned in history books at all, were usually referred to only in connection with their husbands and/or fathers. Sometimes scholars didn’t even bother to mention their first names. Several references to interesting women, a footnote here and a sentence, sometimes turned out to be references to the same woman, but if she’d married several times or if her husband or husbands had been elevated in the peerage and she went by several different names in the course of her life, no one bothered to connect the dots to reveal that they were all one woman and that she led an extremely interesting life. I ended up writing a who’s who of sixteenth-century women. WIVES AND DAUGHTERS: THE WOMEN OF SIXTEENTH-CENTURY ENGLAND was my first published book. It came out in 1984. Unfortunately, with all the discoveries made since then, and with the advent of the Internet to make that information more readily available, it is now horribly out of date. When I launched by KateEmersonHistoricals.com website, I decided to include a who’s who to update some of the entries, at least those of the real women who appear in the novel. Little did I know what I was getting into! Obsession? Probably. I don’t seem to be able to stop myself from adding more entries. For each one I have to do more research. I do much of this online, using genealogies and Google Books, which has digitized many local histories and books on the peerage, as well as biographies and social histories. I still do research in libraries too, borrowing books on Interlibrary loan and buying many oldies but goodies from used book dealers. It’s always a thrill when I find some obscure detail that makes my subject come to life. When I can track down a woman’s family—the names of her parents or what happened to her children—I feel as if I’ve had a major breakthrough. You’d think that would be enough for me, but no. Not only am I hooked on revamping all those old entries, I add new people too. I can’t seem to stop myself. I keep finding more mysteries to solve. For example, I was doing research for the next book in the SECRETS OF THE TUDOR COURT series, BY ROYAL DECREE, which will take readers from the end of Henry VIII’s reign through those of Edward VI, Lady Jane Grey, and Mary Tudor. I was skimming a book by David Loades titled TWO TUDOR CONSPIRACIES when I spotted a reference to a Mrs. Syvestra Butler, who was arrested for plotting against Queen Mary and saying “I would the King and Queen were in the sea in a bottomless vessel.” Mr. Loades did not identify this lady. In fact, one of the few details he gave was misleading. But her given name alone intrigued me and I started hunting. It took awhile, but eventually I discovered her maiden name (Guise) and more about her family and her involvement in treason. There are still mysteries about her. They may never be solved. But I felt a deep sense of accomplishment at being able to identify her to some extent and she is now included in my “Who’s Who of Tudor Women.” Will I use her in the book? It’s too early to say, but the fact that there were women involved in conspiracy is always useful to know. Since I’m writing fiction, I might take what I learned about Sylvestra Guise and use those details in some other way. I have no idea how many entries there are in the Who’s Who at present. This is a work in progress and probably always will be. Not only do I keep adding new entries, but I’m constantly going back in to tweak existing entries when I come across new details or find information that contradicts what I’ve already written. The latter happens more frequently than you might imagine. This is good news for novelists. We can pick the version that works best for the story we want to tell. It isn’t so good for those who write nonfiction. That’s why I have a disclaimer on the Who’s Who to say that the entries contain the best information I have but that I am NOT a scholar. The Who’s Who of Tudor Women, like WIVES AND DAUGHTERS before it, is meant to be a starting place for those who are interested in the real women of the time. It identifies interesting Tudor women and reports what is known, or thought to be known, about each of them. For a few of those women, like Jane Popyncourt (THE PLEASURE PALACE) and Anne Bassett (BETWEEN TWO QUEENS) and Elizabeth Brooke (BY ROYAL DECREE), the Who’s Who entry is also the starting point for a Kate Emerson novel. Kathy has offered one of her historical mysteries to one of my lucky readers! This is for the first book in the Lady Appleton Mystery Series, FACE DOWN IN THE MARROW-BONE PIE and the winner can choose either the hardcover or the large print edition. "Today's letter was not a summons to serve Queen Elizabeth. It came from Lancashire. John Bexwith, my steward at Appleton Manor, is dead." Susanna frowned, surprised that this news should have affected her husband so strongly. "The man was quite elderly," she said hesitantly, "was he not?" "Your memory is excellent," Robert told her, absently tucking an unruly lock of dark brown hair back up under her brocaded cap. "He was found face down in a marrow-bone pie." With that incredible statement, Robert placed the letter in his wife's outstretched hand. 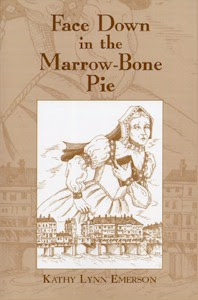 Face Down in the Marrow-Bone Pie is a delightfully cozy Elizabethan mystery introducing Susanna, Lady Appleton. When her husband's steward dies in a unique, ignominious, and highly suspicious manner, Susanna takes advantage of her husband's absence on a political mission for Queen Elizabeth to investigate Bexwith's mysterious demise. Even if Bexwith was poisoned, was it accidental or intentional? As if the case weren't complicated enough, Susanna must also unmask a "ghost"-- or are the ghost and the poisoner one and the same? 1. Since this is Book Blogger Appreciation Week, you must follow me, you must be a Book Blogger & Reviewer, and comment with your Blog URL AND Email Address with a comment other than Enter Me. Entries must be received by midnight September 23rd, the one winner will be announced and emailed the next day and you have two days to respond. Thanks for entering, thanks to Kathy Lynn Emerson for this giveaway, and good luck!